There were two significant pieces of Apple security news yesterday. I find the comment as interesting for the list of things Apple envisions potentially having to hand over as I do for the security claim (though the security claim is admirable). Though Apple’s promise to protect this kind of data only goes so far; as the NYT makes clear, that doesn’t extend to data stored on Apple’s cloud. Which brings us to the second piece of news. As GigaOm notes, Apple’s warrant canary indicating that it has never received a Section 215 order has disappeared. Writer and cyber-activist Cory Doctorow at the time recognized that language as a so-called “warrant canary,” which Apple was using to thwart the secrecy imposed by the Patriot Act. Note, GigaOm goes on to mistakenly state that Section 215 is the basis for PRISM, which doesn’t detract from the importance of noting the dead warrant canary. The original PRISM slides indicate that Apple started complying with Section 702 (PRISM) in October 2012, and the ranges in Apple’s government request data probably reflect at least some of its Section 702 compliance to provide content. So Apple receiving its first Section 215 order sometime last year would reflect either a different kind of request — one not available by targeting someone overseas, as required under Section 702 — or a request for the kind of information it has already provided via a new authority, Section 215. Many of the things listed above — at a minimum, call history, but potentially things like contacts and the titles of iTunes content (remember, James Cole has confirmed the government could use Section 215 to get URL searches, and we know they get purchase records) — can be obtained under Section 215. I find Apple’s dead warrant canary of particular interest given the revelation in the recent DOJ IG Report on National Security Letters that some “Internet companies” started refusing NSLs for certain kinds of content starting in 2009; that collection has moved to Section 215 authority, and it now constitutes a majority of the 200-some Section 215 orders a year. These Internet company refusals must pertain to somewhat exotic requests, otherwise the government would simply take the companies to court one time apiece and win that authority. So we should assume the government was making somewhat audacious requests using NSLs, some companies refused, and it now uses Section 215 to do the collection. Another signal that these requests are fairly audacious is that the FISA Court appears to have imposed minimization procedures, which for individualized content must reflect a good deal of irrelevant content that would be suppressed. While my wildarse guess is that this production pertains to URL searches, everything cloud providers like Apple store arguably falls under the Third Party doctrine and may be obtained using Section 215. That’s not to say Apple’s dead canary pertains to this kind of refusal. But it ought to raise new questions about how the government has been using Section 215. This production will likely be increasingly obtained using USA Freedom Act’s emergency provisions, which permit the government to retain data even if it is not legal, if the bill passes. And the bill’s “transparency” provisions hide how many Americans would be affected. As the press is reporting right now, James “Too Cute by Half” Clapper and Eric Holder have written Patrick Leahy a letter endorsing his version of the dragnet reform bill. Reports claim this shows that Clapper supports reform. To understand why, it helps to understand what this letter was once supposed to do. According to a Senate source who is skeptical this reform does enough, it was supposed to provide language that would endorse civil libertarians’ understanding of key terms of the bill. I’m not sure if the letter is still supposed to do that work — if it is not, that is a story unto itself. But the language in this letter doesn’t make any commitments on the key points of concern. As an initial matter, I was told this letter would include language making it clear that the “connection chaining” language I’ve been so concerned about would limit contact chaining to actual calls made. The letter doesn’t address connection chaining at all. Huh. How about that? The bill also provides a mechanism to obtain telephone metadata records in order to identify potential contacts of suspected terrorists inside the United States. The Intelligence Community believes that, based on communications providers’ existing practices in retaining metadata, the bill will retain the essential operational capabilities of the existing bulk telephone metadata program while eliminating bulk collection. It’s good news the IC is not asking for data retention requirements — but you ought to ask why, given that the most important provider, Verizon, has told the Senate Intelligence Committee that it only keeps billing records — not CDRs — for 18 months. 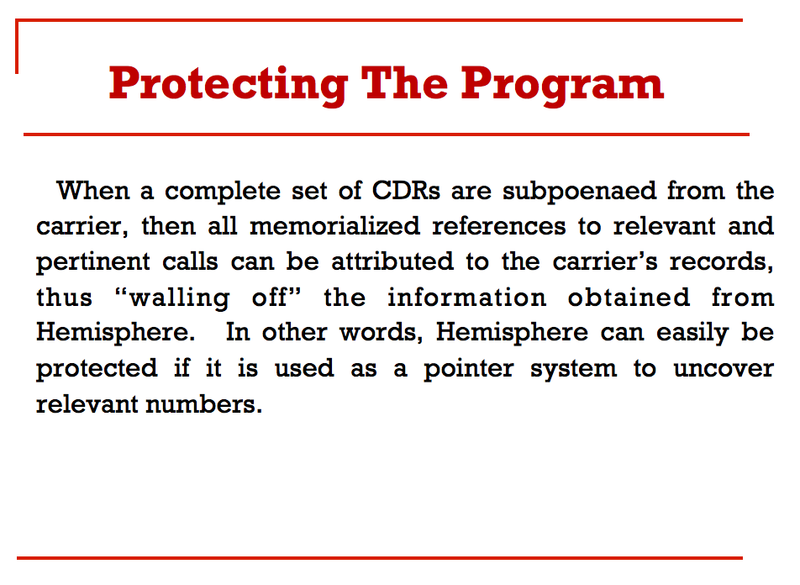 Note, however, that Clapper doesn’t use CDR language here — he uses “metadata,” which is actually broader — potentially far broader — than CDRs as defined by the bill. We know, for example, that the IC considers location data metadata — and James Cole told Mark Warner they might ask for hybrid orders to get location data. We know from the ICREACH documents that the IC admits it uses a different definition of metadata than the FISA Court does (the IC’s definition of metadata not only includes content, but also substantive information about people). We know that providers store customer things-that-count-as-metadata on their clouds, indefinitely. 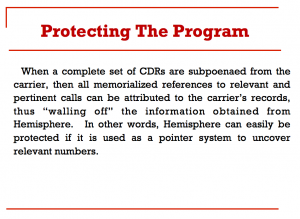 Adopting metadata here, in short, may back off the otherwise limited definition of CDR, which is one of the bills laudable limiting factors. [T]he bill permits collection under Section 215 of the USA PATRIOT Act using a specific selection term that narrowly limits the scope of the tangible things sought to the greatest extent reasonably practicable, consistent with the purposes for seeking the tangible things. Recognizing that the terms enumerated in the statute may not always meet operational needs, the bill permits the use of other terms, provided there are court-approved minimization procedures that prohibit the dissemination and require the destruction within a reasonable period of time of any information that has not been determined to satisfy certain specific requirements. That “reasonably practicable” language is a direct quote from the bill. It adds nothing, and given that Bob Litt refuses to limit FBI back door searches because it’s not practicable, what the IC means by practicable could very easily encompass gross privacy violations — ones that have already been approved by FISC! And remember–the IC can use corporate persons as selection terms. The transparency paragraph includes this language. the transparency provisions in this bill … among other things,  recognize the technical limitations on our ability to report certain types of information. This is James Clapper saying quite clearly to anyone willing to listen that he sees this bill — which explicitly carves out FBI back door searches from any transparency reporting — as Congressional endorsement of the idea that we should never demand the number of FBI back door searches. This language, by itself, ought to make the bill toxic. Congratulations NGOs. You’re backing the idea that the FBI should be able to use 702 and 12333 collected information in criminal contexts with zero oversight or accountability. Finally, Clapper’s letter makes it clear that Leahy’s bill will do nothing to stop ex parte communication between the Executive and FISC. And he even points to John Bates’ ridiculous letter (huh, now we have a better sense of who put Bates up to that!) to warn he’ll carve out even more. We believe that the appointment of an amicus in selected cases, as appropriate, need not interfere with important aspects of the FISA process, including the process of ex parte consultation between the Court and the government. We are also aware of the concerns that the Administrative Offices of the U.S. Courts expressed in a recent letter, and we look forward to working with you and your colleagues to address these concerns. Especially after we learned Bates single-handedly rewrote PATRIOT last year to make it okay to spy on Americans for their protected speech, we should do nothing to accommodate Bates’ wishes, especially since he didn’t speak with the authority of his position. The FISC, as Bates envisions it, doesn’t resemble a real court at all. In short, there’s one piece of good news in this letter — that the IC won’t ask for data retention requirements — and a whole lot of reason to be even more skeptical of the bill. 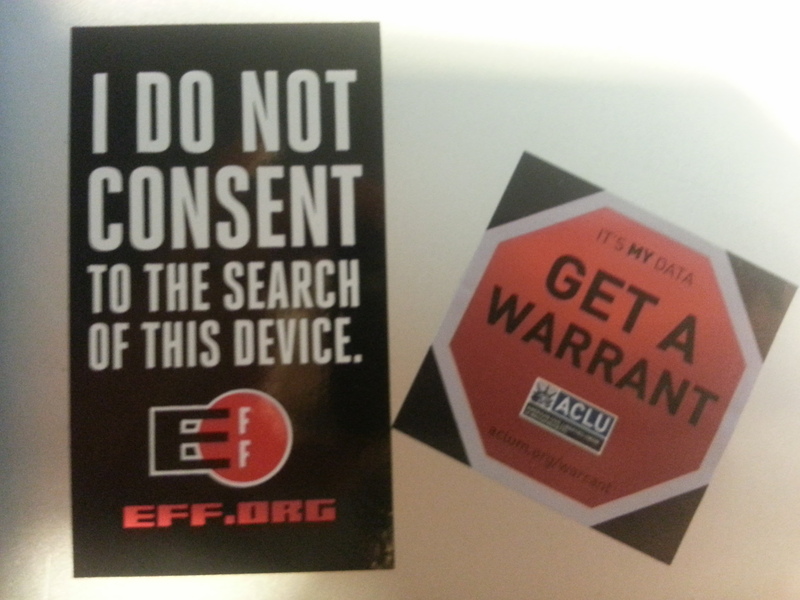 Did ACLU and EFF Just Help the NSA Get Inside Your Smart Phone? The ACLU and EFF normally do great work defending the Fourth Amendment. Both have fought the government’s expansive spying for years. Both have fought hard to require the government obtain a warrant before accessing your computer, cell phone, and location data. But earlier this week, they may have taken action that directly undermines that good work. On Wednesday, both civil liberties organizations joined in a letter supporting Patrick Leahy’s version of USA Freedom Act, calling it a necessary first step. making any amendments that would weaken the important changes described above. ACLU’s Laura Murphy explained why ACLU signed onto the bill in a column at Politico, analogizing it to when, in 2010, ACLU signed onto a bill that lowered, but did not eliminate, disparities in crack sentencing. Reform advocates were at a crossroads. Maximalists urged opposition despite the fact the bill would, in a very real way, make life better for thousands of people and begin to reduce the severe racial and ethnic inequality in our prison system. Pragmatists, fearing that opposition to the bill would preclude any reform at all, urged support. It was a painful compromise, but the ACLU ultimately supported the bill. It passed, astoundingly, with overwhelming support in both chambers. And then something amazing happened. Conservative lawmakers, concerned about government waste, increasingly came to the table to support criminal justice reform. Liberals realized they could vote their conscience on criminal justice without accusations of being “soft on crime.” It has not been easy and there have been many steps backward, but in recent years, we’ve seen greater public opposition to mandatory minimum sentences and real movement on things like reducing penalties for low-level drug offenses. The analogy is inapt. You don’t end crack disparities by increasing the number of coke dealers in jail. But Leahy’s USA Freedom Act almost certainly will increase the number of totally innocent Americans who will be subjected to the full brunt of NSA’s analytical authorities indefinitely. That’s because by outsourcing to telecoms, NSA will actually increase the total percentage of Americans’ telephone records that get chained on; sources say it will be more “comprehensive” than the current dragnet and Deputy NSA Director Richard Ledgett agrees the “the actual universe of potential calls that could be queried against is [potentially] dramatically larger.” In addition, the telecoms are unlikely to be able to remove all the noisy numbers like pizza joints — as NSA currently claims to — meaning more people with completely accidental phone ties to suspects will get sucked in. And USA Freedom adopts a standard for data retention — foreign intelligence purpose — that has proven meaningless in the past, so once a person’s phone number gets turned over to the NSA, they’ll be fair game for further NSA spying, the really invasive stuff, indefinitely. But that’s not the reason I find ACLU and EFF’s early support for USA Freedom so astounding. I’m shocked ACLU and EFF are supporting this bill because they don’t know what the NSA will be permitted to do at the immunized telecoms. They have blindly signed onto a bill permitting “connection chaining” without first understanding what connection chaining entails. As I have reported extensively, while every witness who has talked about the phone dragnet has talked about chaining on phone calls made — all the calls Anwar al-Awlaki made, all the calls those people made — the language describing this chaining process has actually been evolving. Dianne Feinstein’s Fake FISA Fix last fall allowed the NSA to chain on actual calls — as witnesses had described — but also on communications (not just calls) “to or from any selector reasonably linked to the selector.” A February modification and the last two dragnet orders permitted NSA to chain on identifiers “with a contact and/or connection” with the seed, making it clear that a “connection” is something different than a “contact.” The House bill USA Freedumber adopted the same language in a legislative report. Leahy’s bill adopts largely the same language for chaining. Now, it’s possible that this language does nothing more than what NSA illegally did until 2009: chain on both the identifier itself, but also on identifiers it has determined to be the same person. Back in 2009, NSA referred to a separate database to determine these other identifiers. Though that’s unlikely, because the bill language suggests the telecoms will be identifying these direct connections. It’s possible, too, that this language only permits the telecoms to find “burner” phones — a new phone someone adopts after having disposed of an earlier one — and chain on that too. But it’s also possible that this language would permit precisely what AT&T does for DEA in its directly analogous Hemisphere program: conduct analysis using cell site data. The bill does not permit NSA to receive cell site data, but it does nothing to prohibit NSA from receiving phone numbers identified using cell site data. When Mark Warner asked about this, Ledgett did not answer, and James Cole admitted they could use these orders (with FISC approval) to get access to cell location. It’s possible, too, that the telecoms will identify direct connections using other data we know NSA uses to identify connections in EO 12333 data, including phone book and calendar data. The point is, nobody in the public knows what “connections” NSA will be asking its immunized telecom partners to make. And nothing in the bill or even the public record prohibits NSA from asking telecoms to use a range of smart phone information to conduct their analysis, so long as they only give NSA phone identifiers as a result. In response to questions from Senators about what this means, Leahy’s office promised a letter from James Clapper’s office clarifying what “connections” means (No, I don’t remember the part of Schoolhouse Rock where those regulated by laws get to provide “clarifications” that don’t make it into the laws themselves). That letter was reported to be due on Tuesday, by close of business — several days ago. It hasn’t appeared yet. I asked people at both EFF and ACLU about this problem. EFF admitted they don’t know what this language means. ACLU calls the language “ambiguous,” but based on nothing they were able to convey to me, insists getting smart phone data under the guise of connection chaining would be an abuse. ACLU also pointed to transparency provisions in the bill, claiming that would alert us if the NSA starting doing something funky with its connection language; that of course ignores that “connection chaining” is an already-approved process, meaning that existing processes won’t ever be need to be released. It also ignores that the Administration has withheld what is probably a directly relevant phone dragnet opinion from both ACLU and EFF in their dragnet FOIA. I get Laura Murphy’s point about using USA Freedom to start the process of reform. But what I don’t understand is why you’d do that having absolutely no idea whether that “reform” codifies the kind of warrantless probable cause-free access to device data that ACLU and EFF have fought so hard to prevent elsewhere. ACLU and EFF are supposed to be leaders in protecting the privacy of our devices, including smart phones. I worry with their embrace of this bill, they’re leading NSA right into our smart phones. https://www.emptywheel.net/wp-content/uploads/2016/07/Logo-Web.png 0 0 emptywheel https://www.emptywheel.net/wp-content/uploads/2016/07/Logo-Web.png emptywheel2014-08-01 11:37:232014-08-01 18:02:14Did ACLU and EFF Just Help the NSA Get Inside Your Smart Phone? In the Senate Intelligence Committee hearing on HR 3361 — which I call the USA Freedumber Act because it makes the dragnet worse in several ways — Dianne Feinstein used her opening statement to talk about the role of “specific selection term” in the bill. The problem comes with the definition of a “specific selection term,” which is not clear on its face and I believe it’s confusing. I’m glad that Feinstein is concerned about the same thing I’ve been focusing on for a month. The problem with trying to prevent “bulk collection” using the definition of selection term — even aside from the fact that the Intelligence Community understands “bulk collection” to mean something entirely different from what normal people understand it to mean — is that it will be abused. We didn’t even get out of the hearing without such cynicism. At the hearing, Deputy Attorney General James Cole assured Martin Heinrich and Mark Udall that statements in the legislative record indicating a desire to limit such collection would prevent any abuse. This is the same DAG whose DOJ argued — just the day before!!! — that the legislative record of FISA, which clearly indicates the congressional intent that some defendants will get to review their FISA applications, should be ignored in favor of the 36 year history during which no defendants got such review. Cole’s comments are all the proof we need that the Executive cannot be trusted to cede to Congress’ wishes (not to mention that the legislative record is far more ambivalent than Cole pretended). So I’m grateful Feinstein is trying to tighten the definition (though I don’t think that is the workable way to improve the bill). But I’m a bit confused by Feinstein’s confusion. You see, as I noted some weeks ago, the term “selection term” is already used for Section 215, and has been for at least a year. And at least in phone dragnet Primary Order standard references to FISA content orders (that is, to traditional FISA warrants and the like), they’re using “selection term” as well. The intelligence community and the FISA Court already have some common understanding of what “selection term” means — and Primary Orders appear to define the term in a classified-to-us-but-not-Feinstein footnote — and yet Feinstein is confused about what “specific selection term” might mean? Granted, “selection term” is slightly different than “specific selection term.” Still, given that the “selection term” appears to be defined — and used — in the existing program, I would hope that Senator Feinstein would have some clarity about what it means. Perhaps the way to start this discussion is to publicly explain how the IC is currently using “selection term”? The Senate Intelligence Committee is in the middle of its Snowden Day hearing on the USA Freedumber Act. I’ll have more to say about it later (spoiler alert: the hearing has proven that the overseers don’t understand the program they’re currently overseeing). The highlight was, surprisingly, when Mark Warner questioned the government witnesses. Warner (who used to be a telecom mogul) got the government witnesses to concede to two key points. First, Warner noted that under the new scheme, every telecom would be subject to government requests. As a result, he said, “On factual basis, the number of calls scrutinized universe will be exponentially larger.” Deputy Attorney General James Cole at first tried to prevaricate. But then admitted that more records would be exposed. Then, Warner noted that telecoms have to keep cell location, and that the current Section 215 program does not obtain cell location. He asked if the NSA could use or obtain cell location going forward. Cole did not deny that; he admitted that sometimes it is very helpful. Thanks to Mark Warner for getting these two details on the record, as I have been arguing both were true, but now can confirm they are. FISA Court Chief Judge Reggie Walton just issued a rather unhappy order requiring the government to explain why it materially misstated the facts about whether any plaintiffs had protection orders that governed the phone dragnet. Generally, he wants to know why the government didn’t tell him that EFF had protection orders in the Jewel and Shubert cases. More specifically, he wants to know why they didn’t tell him that — as I reported here — the EFF had asked the government how they could claim there was no protection order when they had one in their suits of the larger dragnet. As the government is well aware, it has a heightened duty of candor to the Court in ex parte procedings. See MODEL RULES OF PROF’L CONDUCT R. 3.3(d) (2013). Regardless of the government’s perception of the materiality of the preservation orders in Jewel and Shubert to its February 25 Motion, the government was on notice, as of February 26, 2014, that the plaintiffs in Jewel and First Unitarian believed that orders issued by the District Court for the Northern District of California required the preservation of the FISA telephony metadata at issue in the government’s February 25 Motion. E-mail Correspondence at 6-7. The fact that the plaintiffs had this understanding of the preservation orders–even if the government had a contrary understanding–was material to the FISC’s consideration of the February 25 Motion. The materiality of that fact is evidenced by the Court’s statement, based on the information provided by the government in the February 25 Motion, that “there is no indication that nay of the plaintiffs have sought discovery of this information or made any effort to have it preserved.” March 7 Opinion and Order at 8-9. In a number of places, Walton provides an out for the government, suggesting they might just be stupid and not obstructing (those are my words, obviously). He even goes so far as to suggest that DOJ might have an internal communication problem between the Civil Division, which is litigating the EFF suits, and the National Security Division, which works with FISC. But then he notes that both Civil AAG Stuart Delery and Acting NSD AAG John Carlin submitted the filings to him. The government’s failure to inform the FISC of the plaintiffs’ understanding that the prior preservation orders require retention of Section 591 telephony metadata may have resulted from imperfect communication or coordination within the Department of Justice rather than from deliberate decision-making.4 Nonetheless, the Court expects the government to be far more attentive to its obligations in its practice before this Court. 4 Attorneys from the Civil Division of the Department of Justice participated in the E-Mail Correspondence with plaintiffs’ counsel. As a general matter, attorneys from the National Security Division represent the government before the FISC. The February 25 Motion, as well as the March 13 Response, were submitted by the Assistant Attorney General for the Civil Division and the Acting Attorney General for the National Security Division. Frankly, I hope Walton ultimately tries to learn why he wasn’t told about these protection orders in more detail years ago, when the government was deciding whether or not to destroy evidence of lawbreaking that Walton first identified in 2009. I also hope he gets to the bottom of why Deputy Attorney General James Cole had to intervene in this issue. But for now, I’m happy to see DOJ taken to the woodshed for misinforming the Court. Update: Meanwhile, on the other coast, Judge Jeffrey White issued a protection order that is far broader than the government would prefer it to be. The government had implied that the First Unitarian Church suit only covered Section 215; earlier this week (I’ve got a post half written on it), EFF argued they’re challenging the dragnet, irrespective of what authorization the government used to collect it. Nothing in White’s order limits the protection order to Section 215 and this passage seems to encompass the larger dragnet. Defendants’ searching of the telephone communications information of Plaintiffs is done without lawful authorization, probable cause, and/or individualized suspicion. It is done in violation of statutory and constitutional limitations and in excess of statutory and constitutional authority. Any judicial, administrative, or executive authorization (including any business records order issued pursuant to 50 U.S.C. § 1861) of the Associational Tracking Program or of the searching of the communications information of Plaintiffs is unlawful and invalid. Update: fixed a typo in which I inadvertently said Walton caused rather than found the lawbreaking in 2009.